Please note: you are not looking at the Mill Hill Observatory web site! 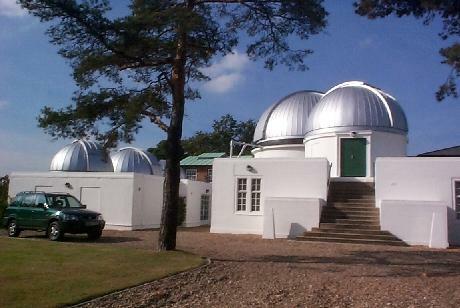 The domes at Mill Hill Observatory in October 2002. The nearer dome on the right contains a 24" Ritchey-Chretien and behind that is the Radcliffe dome containing twin refractors, an 18" refractor for visual observing combined with a 24" refractor now used for CCD imaging (see below). In the three smaller domes to the left are an 8" Fry refractor and some LX200's. Want to visit Mill Hill Observatory? The Observatory is open to the public but advance booking is required, and no visitor can be admitted without having made an advance arrangement. Please see the Tours and Public Information page to arrange a visit. Want to visit Mill Hill Observatory in London? The Observatory is open to the public but advance booking is required, and no visitor can be admitted without having made an advance arrangement. Please see the University of London Observatory Tours and Public Information page to arrange a visit. The X-Y measuring machine (below) was located on the ground floor of the white building to the right during 1976 - 1985. 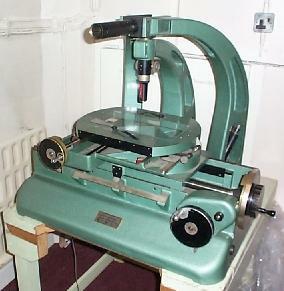 The X-Y measuring machine in 2002, made by The Precision Tool & Instrument Co. Ltd, Thornton Heath, used to measure astrometric positions from negatives in the late 1970's and early 80's.